Seollal, or Korean Lunar New Year, is a holiday I always looked forward to as a kid. My family in Korea would spend weeks preparing for the big event. We would all travel to my grandparent’s home in a small village north of Seoul, near the 48th parallel. Here I would see my many cousins, aunts and uncles. We played games, exchanged gifts and feasted on delicious food. I looked forward to this holiday every year. Seollal 설날 is the most celebrated holiday in South Korea. It’s celebrated not only to mark the passage into a new year, but it is also a time for families to catch up with each other, pay respect to ancestors and to feast! Korean Lunar New Year marks the first day of the lunar calendar. It is the first day of the second new moon after winter solstice. The exact day of the lunar new year will vary from year to year. 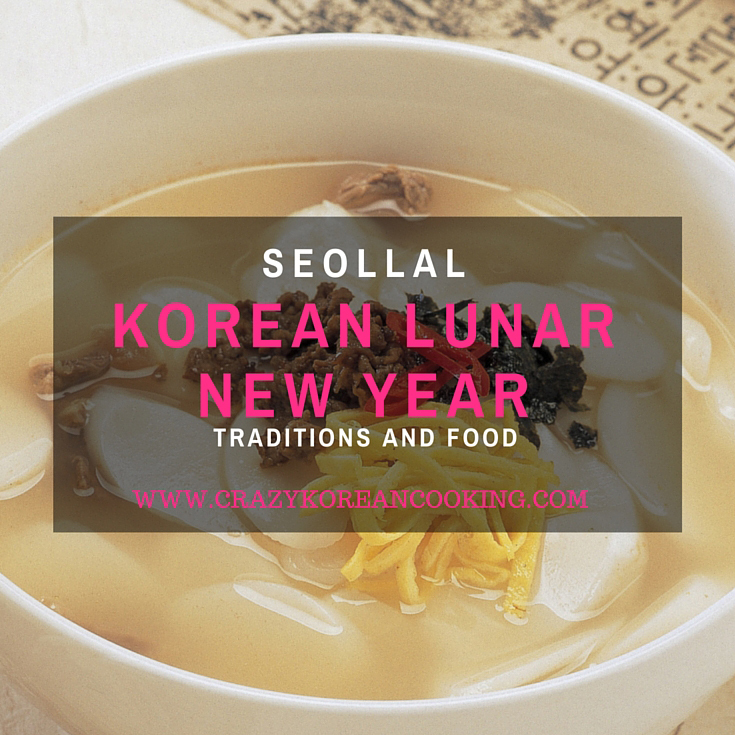 Seollal’s celebration lasts for three days, starting the day before and ending the day after the Lunar New Year. It’s a public holiday in South Korea; many businesses are closed during this time and paid leave is given so families can travel. Nowadays many Koreans also celebrate the Gregorian calendar New Year’s day on January 1st; however, it is not as big of a celebration. During the week leading up to Seollal, Koreans shop for gifts to give family members. Gifts include fresh fruits, ginseng, honey, gift baskets (with tuna, spam, traditional sweets, dried fish) toiletries and cash. The first day of the celebration begins with Charye. Charye is a memorial service that prays for the peace and good health of the ancestors. Family members will dress up or wear a hanbok (the traditional Korean dress). Everyone will then gather in front of a table prepared for the ancestral rite. 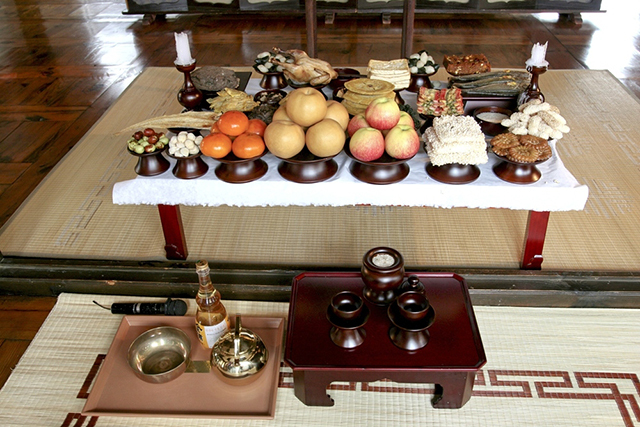 The ritual dishes will vary by region, but the common ones are tteokguk (rice-cake soup), rice, meat, seafood, liquor, fruit and vegetables. The ceremony will begin with deep bows to greet the ancestors. The rite includes prayers and offerings for the ancestors. At the end of the rite, the ritual food, called eumbok, is shared; this passes the hopes and virtues of the ancestors to those who partake. As a kid, my favorite part of Seollal was getting New Year’s money, called sebaedon. After the meal, the kids (or any young family member) perform a New Year’s bow, or sebae, to an elder family member in exchange for blessings and sebaedon. The bow differs depending on whether you are male or female. All the sebaedon received is then put into a fortune pouch called a bokjumeoni. How to do a sebae bow. The rest of the holiday celebration is spent by visiting with family members and playing folk games. Yut-nori is a popular game that involves the use of 4 wooden sticks, tokens, and a simple game board. This strategy game has been a part of Seollal for hundreds of years. 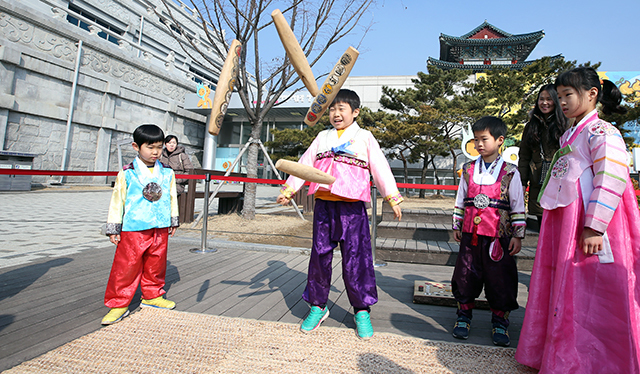 Some other common games played during this holiday are jegichagi (a hacky-sack type game), yeonnaligi (kite-flying), neolttwigi (see-saw) and paengi chigi (top-spinning). The biggest part of Seollal is the food! 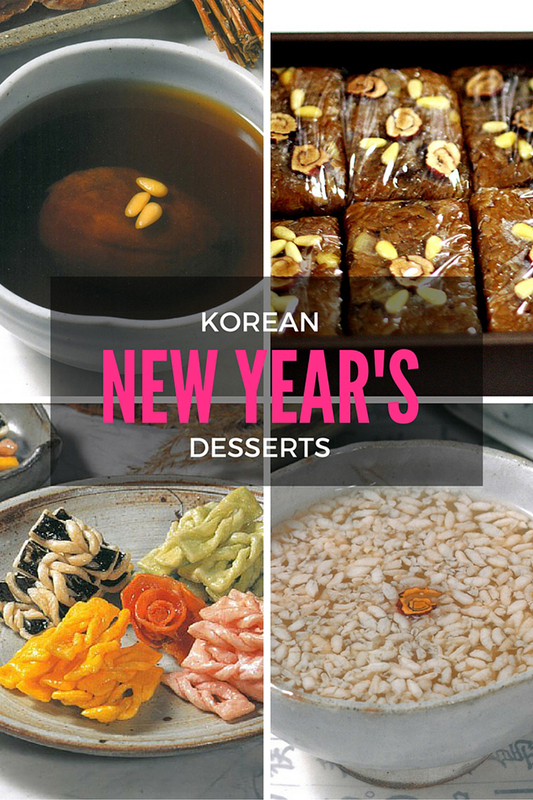 The New Year’s feast consists of several dishes, but there are a few that are absolutely essential. Tteokguk (ddukguk)is the most representative of Seollal dishes. Eating a bowl of tteokguk symbolizes growing a year older, along with good health and a long life. A common question heard on New Years is “how many bowls of tteokguk have you eaten?” It’s a fun way to guess someone’s age and joke about how many more bowls they will eat. Manduguk is similar to tteokguk, but with dumplings. Some areas will omit the sliced ddeok and only have the dumplings. 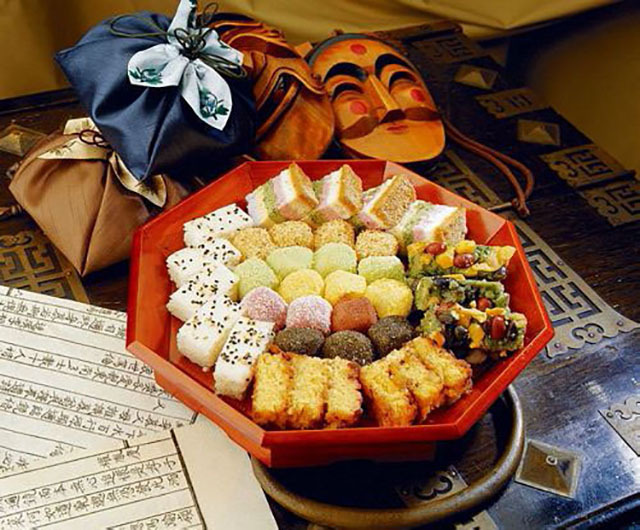 Ddeok is a category of rice cakes made from glutinous rice flour. There are hundreds of types of ddeok eaten year-round in Korea. However, it’s always on the the table for celebratory events like weddings, parties and especially holidays. There are several types of jeon (pancakes) at a Seollal feast. Some popular jeon are buchujeon (garlic chive),kimchi jeon and saengseon jeon (fish). Galbij jim is a popular meat dish prepared for special occasions. It’s beef short ribs braised in a sweet and salty sauce with carrots and potatoes. Japchae, Korean glass noodles, is a delicious dish full of flavor and color. It’s enjoyed year-round as a healthy and light appetizer or side dish. Japchae is present on most special occasions. Su-jeong-gwa is a traditional fruit punch made from persimmons, cinnamon and ginger. It’s often garnished with pine nuts. Sikhye is a sweet beverage made with malt barley, malt powder and rice. The drink is often consumed after heavy meals and helps aid in digestion. Taraegwa is a twisted ribbon-shaped traditional Korean confection made from wheat flour and flavored with cinnamon, ginger, rice syrup and pine nuts. Yaksik is a nutritious sweet rice bar with nuts and Korean dates. It belongs in a category of Korean “medicinal” foods which features healthful and flavorful ingredients. 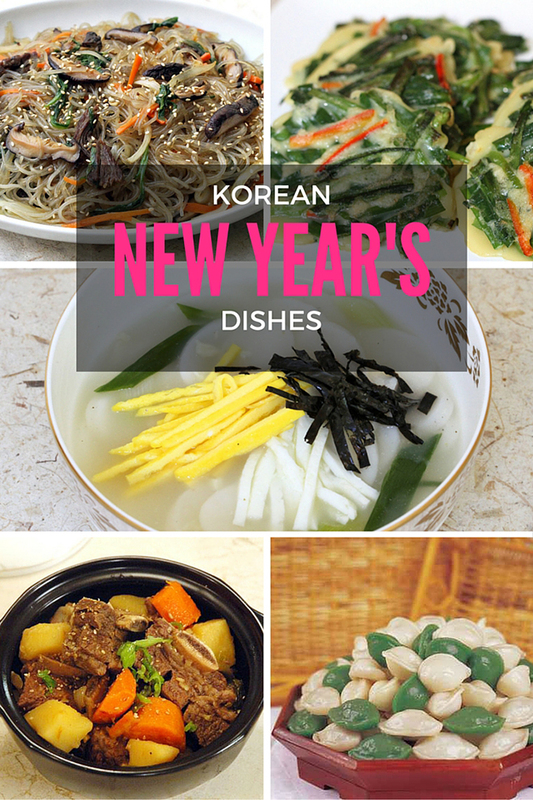 Whether you celebrate New Year’s day on January 1st or the Lunar New Year, be sure to have plenty of delicious Korean dishes to share with your family and friends. thanks for sharing this awesome dish! !